A solid shard that forms in coldblood. which does not crystallise is called a bloodstone. 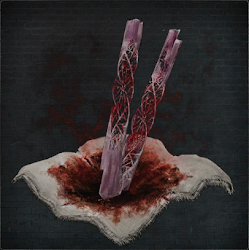 Twin Blood Stone Shards are the material you'll need to fortify weapons up to +6, which you should start working towards after getting through the first couple of areas in the game. The earliest point you can reliably pick up some of these items is in Hemwick Charnel Lane, and then you'll be able to find an abundance of them in the Forbidden Woods. 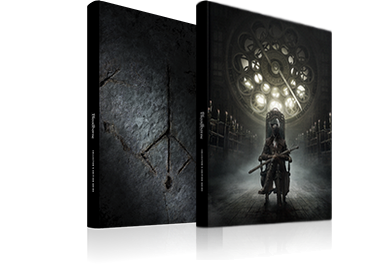 If you obtain the Cosmic Eye Watcher Badge this item will be added to the Bath Messenger's shop inventory at a cost of 10,000 Blood Echoes each, and once you've progressed far enough to advance the time to Blood Moon, you'll also be able to get them from the Insight Trade for 2 Insight. The Large Huntsmen and Church Giants in the Forbidden Woods have a good chance to drop them when killed, but you may also want to seek out the Lost Children of Antiquity in Forsaken Cainhurst Castle (or Kidnappers, especially those found in Chalice Dungeons), as they have higher drop rates. Alternatively, if you're venturing into depth 2-3 Chalice Dungeons, you may also get one of these as a drop from the bosses you defeat there. You'll be able to buy them from the Insight shop before you can get them from the Bath Messengers. Cosmic Eye Watcher Badge: This badge can be found in Upper Cathedral Ward. Although you won't be able to reach it until very late, picking it up allows you to purchase Twin Bloodstone Shards from the shop. This will allow you to experiment with a wider variety of weapons. The Sedatives it unlocks are also useful, as any hunter who has stared down a Winter Lantern should know! In-game description was slightly different (right) on version 1.0 than what there is now on version 1.09.